Media captionTom Morgan described the flight as "magical"
A British adventurer has flown 25km (15.5 miles) across South Africa suspended from 100 helium balloons. Tom Morgan, from Bristol, reached heights of 8,000ft (2,438m) while strapped to a camping chair, in scenes reminiscent of the Pixar smash Up. The 38-year-old spent two days inflating balloons ahead of the flight, which he described as "magical". The challenge moved to South Africa on Friday after several failed attempts in Botswana. "The problem was finding a good weather window and it was difficult to protect the balloons as they kept bursting," Mr Morgan said. With just enough helium left for one more attempt, the adventurer and his team moved their base to just north of Johannesburg. Describing the experience as "unbelievably cool", Mr Morgan also admitted feeling "somewhere between terrified and elated" as he rose in the air. "I had to keep my cool and start gradually cutting the balloons." 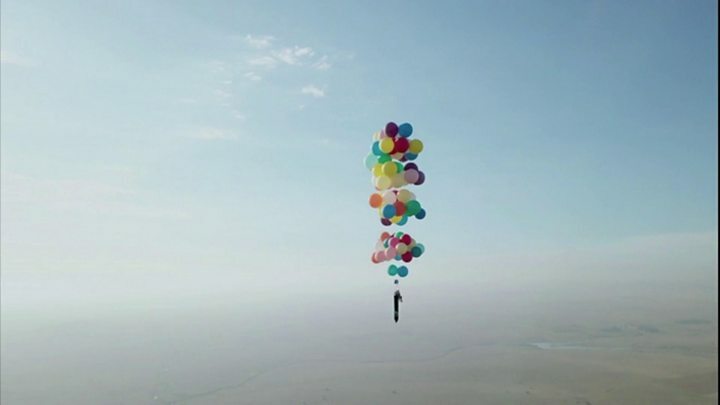 Mr Morgan, who has lived in Bristol for 15 years and runs an adventure company, wants to eventually set up a competitive helium balloon race in Africa. "We will have to avoid areas with lots of spiky bushes though," Mr Morgan said.